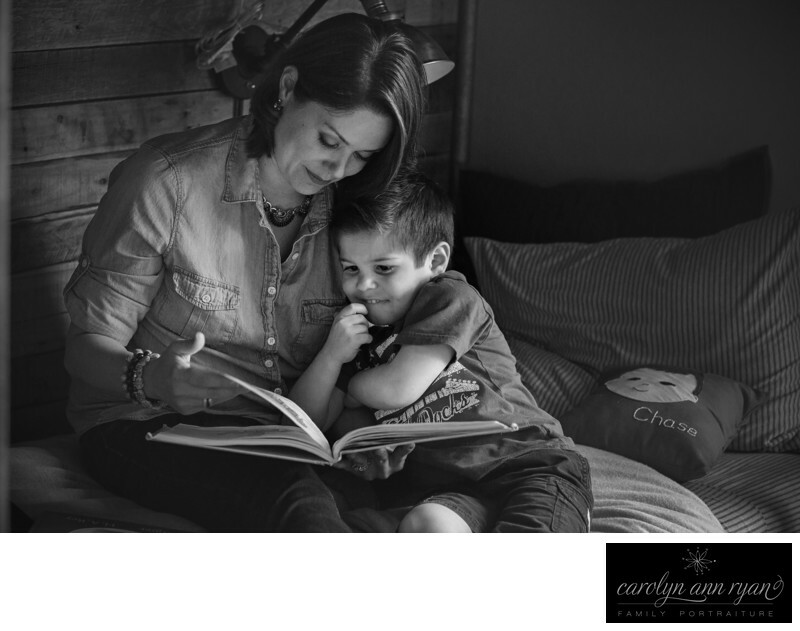 I was asked to photograph this beautiful Mom and her son in his newly decorated bedroom having sweet moments together. Well, all she had to do was open a book, and the sweet moments just happened. I love how he just cuddled into her arms ready to read with his Momma. It's the simple, classic moments in life that are filled with memories. They bring us back to childhood and to our favorite places. Being a mom now, I love reading time with my kids and this photograph speaks to my heart as I remember every night with my own little munchkins snuggled into my arms and lap to read a good story together. Keywords: b&w (51), black and white (54), Charlotte NC (180), Family (171), indoors (30), Mother and son (15), reading (3). 1/125; f/4.0; ISO 3200; 85.0 mm.